I am not a fearless dairy woman. Last summer, I documented my lifelong squeemishness about cowy milk containing thick chunks of cream or downright butter. I like a pasteurized layer of separation between me and the bovine source of my dairy. But, in every place I have lived outside of the US, there are only extremes in dairy production and no middle ground. One either buys raw milk, still steaming, delivered directly from farmers in metal cans or you buy ultra-pasteurized milk in UHT boxes, with all culture cooked out of it to allow it a shelf life of years. I have been wanting to dabble in the queso-arts lately, but I’m not brave enough to flag down the local farmer who I see delivering milk from the back of his truck, using a giant dipper to pour it into the residents’ own jugs. I think that is a beautiful thing and I should try it, but actually I don’t have the language skills to even approach it. When I was in London two weekends ago, we went to the venerable royal provisioner temple of Fortnum and Mason. Mostly, we bought English cheeses that we can’t get here: cheddar and Stilton. I will now admit, though, that I tucked in two quarts of very creamy whole milk with a cheese-making project in mind. The process for making ricotta or cream cheese is actually as simple as claim says. The difference between the two is the ratio of butter fat to milk: more fat= cream cheese, less fat= ricotta. Once the curds have been lifted from the whey, the whey can be used in a very nice meat braise, like milk-braised pork shoulder. This was another of the recipes I piloted during my month-of-endless-cooking in April. The leftover meat is fantastic shredded into tamales or on tostadas. 1. Line a large colander with a layer of cheesecloth and place in the sink or over a bowl if you want to save the whey. Wet the cheesecloth to hold it firmly in place. 2. Over medium-high heat, bring the milk and salt to a gentle simmer in a heavy large pot. 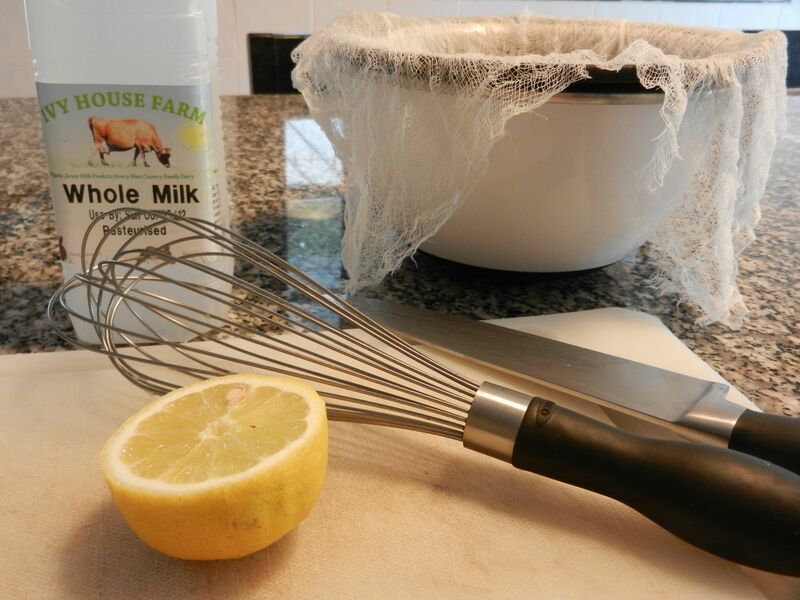 Stir in the lemon juice and continue to simmer gently until curds begin to form and float to the top, 1 to 2 minutes. They will first look like spatters of white, then gather into soft, cloud-like clumps. 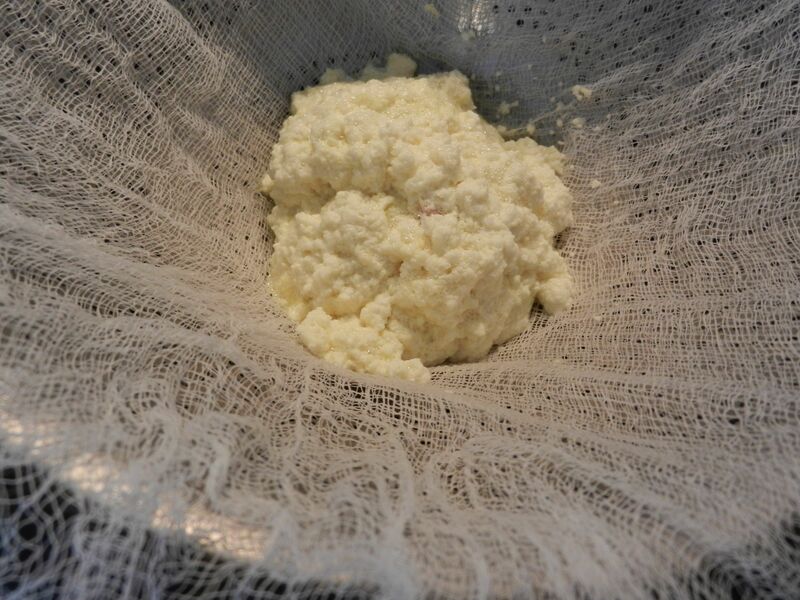 When you see the liquid begin to clear of cloudiness and the curds are firming up but not hard, scoop them out with a slotted spoon or sieve. 3. Let the curds drain thoroughly in the lined colander. If very soft, press gently to extract a little moisture, but take care not to dry out the cheese. Turn into a bowl, cover and chill. Refrigerated cheeses keep for a week, but the ricotta is at its best eaten fresh. Season the pork with salt and pepper. Heat the olive oil in a Dutch oven or heavy casserole over medium-high heat until it starts to shimmer. Add the pork and sear all over until well browned. Transfer the pork to a plate and set aside. Remove all but 3 tablespoons of fat from the pot. Return the pot to medium heat and add the onions, juniper berries, bay leaves, and rosemary and cook until the onions are tender, about 5 minutes. Add the garlic and continue to cook until the garlic is lightly golden, about 3 minutes. Return the pork to the pot and pour in the milk. Cover and place in the oven (350 F) to braise for 2 hours, turning the pork 2 or 3 times during the course of cooking. Uncover the pork after 2 hours and cook for 30 minutes, or until the meat is fork-tender. Transfer the roast to a plate and tent with aluminum foil. Remove the bay leaves, rosemary, and juniper berries from the milky sauce. Skim any excess fat from the top. The milk may have curdled in the cooking process. Using an immersion blender, process the sauce until smooth. Add the nutmeg and walnuts. Return to the oven to heat through. Taste and adjust the seasoning. Slice the meat and serve with the sauce spooned over the top. This is great! I’ve been making ricotta using our UHT milk here with good results, though probably not as good as if made with fresh milk. Isn’t it easy?! I’m really glad to know it works with UHT milk. For one, I can fill my suitcase with wine instead of milk and for another, it doesn’t smell like a cow shed. And I call myself a farm girl. I’ve given in to the milk that comes unrefrigerated, but I can’t think about drinking it by the glass yet. Still squeamish as you mention. We also have a milk vending machine, in my little town outside Milan, that you can fill your own glass jug up at. I hear that this milk is thicker…and probably closer to the cow than what I find at the store. But, this, too, scares me!